Floating masses of garbage off some of the Caribbean’s pristine beaches offer grim evidence of a vast and growing problem of plastic waste heedlessly dumped in the ocean, local residents, activists and experts say. These “trash islands” have been captured in images by photographer Caroline Power, who lives on Honduran island of Roatan. The problem shows that trash “continues to enter our oceans that leads to the formation of these trash patches,” she told AFP by email. Some of the detritus clumped together in the waves that she documented was being deposited on beaches around Omoa, a seaside town in northern Honduras. It included hospital waste and plastic containers of all types. “It’s an environmental disaster,” Omoa’s deputy mayor, Leonardo Serrano, told AFP. Serrano blamed the garbage on neighboring Guatemala, claiming that communities dumped their refuse into a river and that it had gathered at sea to form floating islands. “We also do not know where the garbage comes from,” she said. “One of the main sources are rivers on the mainland of Honduras and Guatemala,” she said. “But the rest could come from anywhere. It could come on currents from anywhere in Central America or the Caribbean. During the May to December rainy season in Honduras, the floating garbage dumped on Omoa’s promontories and beaches damages the town’s appeal, said municipal tourism chief Amilcar Fajardo. On a walk, he showed plastic bottles, medicine containers and empty insecticide cans with Guatemalan labels to prove his point. Marine biologist Nancy Calix said that much of the garbage sinks to the seabed, damaging underwater fauna. “We have found fish, even turtles up to a meter wide, dead after ingesting these plastics,” she said. The plastics waste problem came to light three years ago but has been getting worse since, Calix said. Omoa’s town hall pays for beach clean-ups, but the trash washes up faster than the pick-up crews can remove it. “On Friday, we filled 20 dump trucks of 13 cubic meters (460 cubic feet) each, and it made almost no difference,” Omoa Mayor Ricardo Alvarado said. “We are even finding bags holding blood” that came from Guatemalan hospitals, he said. Alvarado said that sometimes parts of beach are dug up and the garbage is buried. Mostly, however, the waste is taken to a municipal garbage dump at high cost to local taxpayers. Guatemalan Environment Minister Sydney Samuels earlier this week promised to build a $1.6-million trash-handling plant on the Motagua River that runs along the Guatemalan side of the border to handle some of the trash. Earlier this month Guatemalan Foreign Minister Sandra Jovel met with Honduran officials to discuss the pollution problem. 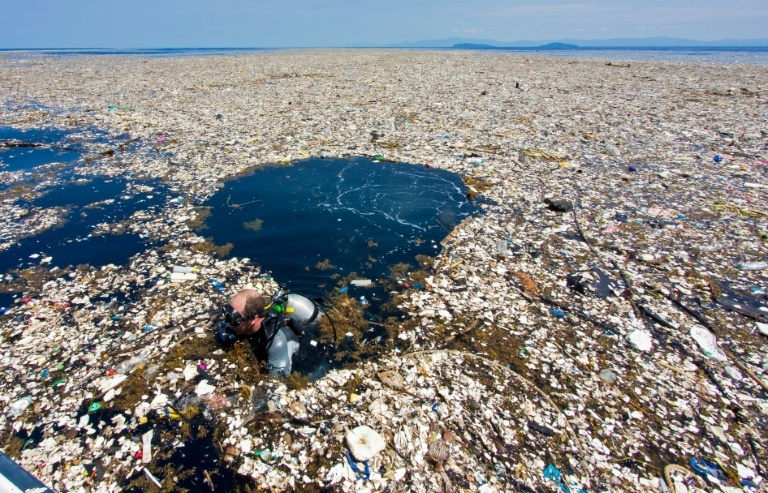 According to the UN Environment Programme, 6.4 million tons of trash end up in the sea each year, with most of it — 70 percent — falling into the depths. Some 15 percent stays circulating on ocean currents, while the rest washes up on beaches.